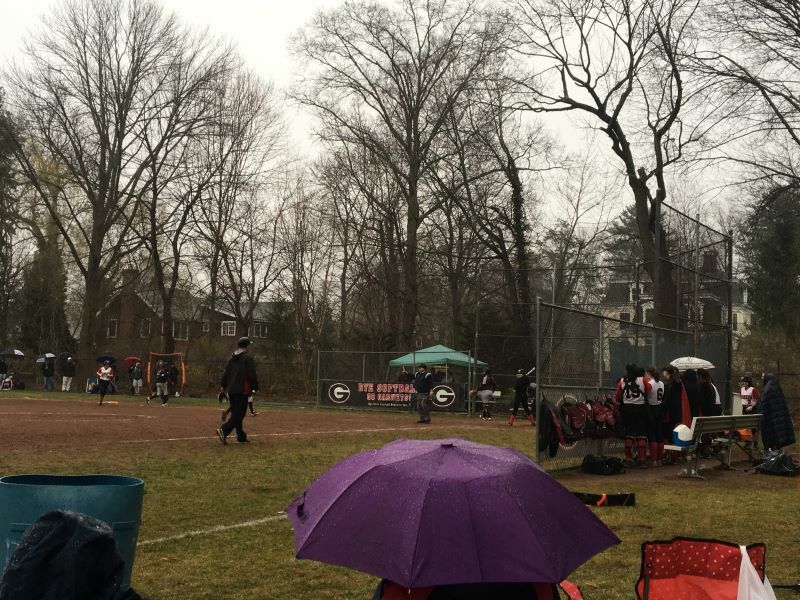 Rye-Harrison games are always guaranteed to be high-intensity no matter the sport, and the varsity Softball game on April 9 was just that. Both teams played hard through the nasty weather, and until the game was called off in the fourth inning, neither gave up. Rye got off to a strong start when Mara Ball struck out the first Harrison batter and Riley Volpe and Caitlin Antinozzi both caught balls deep in the outfield to register the second and third outs. When Rye stepped up to the plate, they demonstrated the same intensity as they had had on the field. Ball hit a solo home run to give Rye a 1-0 lead after one. Then, in the second inning, Harrison came back with a deep hit that gave them three runs. The competition was fierce – junior Shelby Gadaleta was hit in the shin by Harrison’s pitcher and had to be taken out for a few minutes. Sonia Eckstein bunted, which allowed sophomore Natasha Meyer to score. Athena Hadjipanayis hit a grand-slam home run deep into left field, putting Rye ahead 6-4. The lead was short-lived as Harrison scored four more runs in the next inning. Eventually, the pouring, freezing rain became more of a hazard than an inconvenience. A number of girls slipped in the dirt while trying to catch the ball or running the bases. At the bottom of the fourth inning with Harrison ahead 10-6, the two umpires decided to postpone the rest of the game until a later date.